We opened our brand new 3,600 square foot Fitness & Wellbeing facility in May 2018 and we’re not shy about being ‘loud & proud’ about how much we love it. In fact, we even re-designed out entire fitness system from the ground up, based on utilising the space in a very unique way. To the outsider looking in, or the newcomer through the door, the layout might look “pretty” or “fancy”, but there’s a lot of method to the madness - every detail of the gym, from the type of flooring, to how the flooring is laid, to the equipment placement has purpose and thought process behind it. 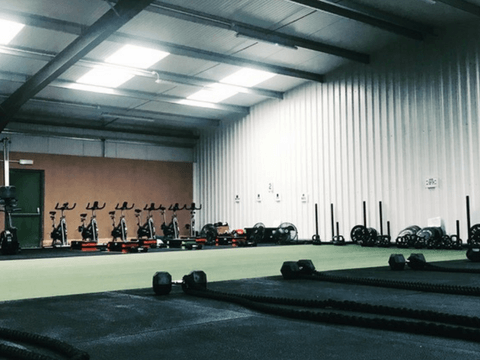 We don’t run “fitness classes” - we run structured, group Personal Training, using cutting-edge methods to deliver transformative results in a safe, structured and inclusive manner. No stone is left unturned on our quest to provide the most game-changing fitness experience in Harrogate. Need to be able to shower so you can get straight to work? We’ve got your back. Want FREE unlimited parking at all times? Consider it done. You’d like a little ‘hangout’ area where you can chill before or after a session with us - maybe with a coffee? Yeh, we wanted that too, so we built it. You want the same state of the art training principles using the same equipment and programs as we use in our 1-1 Personal Training packages? That’s a gimme! And you’d like to have ultimate flexibility on when you can train - because let’s face it, we all have busy lives, and our schedule changes a lot of the time. No problem at all. We have the following time slots on our ‘menu’.